Recently, IBSA hosted a Midwest regional meeting that included the state executive directors, missions directors, evangelism directors, and church health directors from ten Baptist state conventions. Our main purpose was to finalize plans for the 2015 Midwest Leadership Summit that will be hosted here in Springfield next January. But it was also an interesting time to compare notes on Baptist work throughout our Midwest region. Here are four observations about what “all” Midwest state conventions seem to be experiencing, and then also about where we in Illinois find ourselves these days. First, there was a shared desire to keep fewer ministry resources within our churches and region, and to share more with the vast mission fields outside our states, especially internationally. Here in Illinois, our Cooperative Program giving that goes beyond the state is the fifth highest percentage among all 42 state conventions. The past two years, we have sent extra year-end gifts that made those CP percentages the highest in IBSA’s history. A second observation is that most Midwest state conventions are feeling a tight “squeeze” between the North American Mission Board’s lower and more designated funding (for church planting exclusively), and generally flat to lower giving from churches through the Cooperative Program. Here in Illinois, NAMB funding shifts have necessitated that we absorb full responsibility for our state WMU and Women’s Ministry Director, for other missions positions and initiatives that are not specifically church planting, and for funding that assists local associations. We have also received notice that areas such as collegiate ministry, urban ministry centers, and disaster relief coordination will not be funded by NAMB in future budget years. A third observation is that among our group of Midwest Baptist leaders we are experiencing a noticeable amount of transition and turnover. My personal sense is that the combination of financial pressures and feelings of not being appreciated are taking their toll on a lot of good people that help a lot of small to medium-sized churches, especially. Here in Illinois, we have been seeking to manage a gradual downsizing and restructuring of our IBSA staff without necessitating traumatic changes for either personnel or ministries. However, I sense among some of our staff the same uneasiness about the future security of existing ministries. Finally, even in the midst of these challenges, I observed state convention leaders that continue to believe strongly in their ministries of strengthening and starting local churches in their Midwest contexts. They—we—are trusting the Lord into the future, but also appealing more and more intentionally and urgently to the faithful churches in our respective states to validate, value, and directly support state missions. Here in Illinois, the most direct and supportive way your church can do that is through the Mission Illinois Offering. Most churches receive that offering in September, but you can contribute through the MIO any time in the year, and 100% of that offering goes to support our state missionaries and state missions efforts among churches right here in Illinois. Across the Midwest, Baptist state conventions, most of which are smaller than Illinois, are facing pressures and decisions that may soon be ours, at a time when our culture needs the Gospel more than ever, and our churches need assistance more than ever. 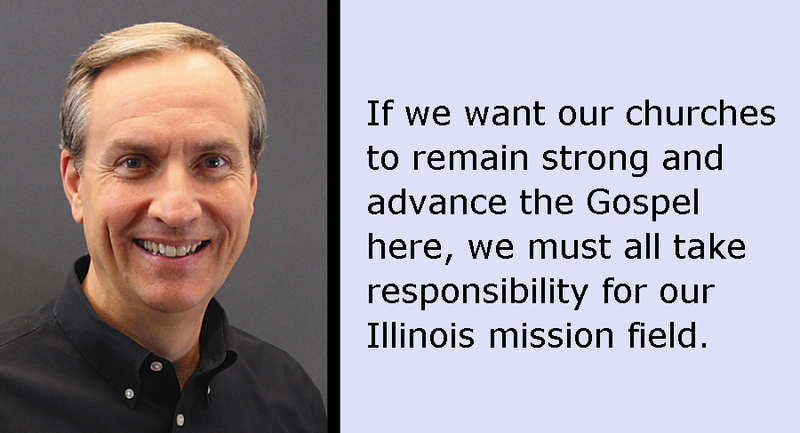 If we want our Midwest state of Illinois and its churches to remain strong and advance the Gospel here, we must all take responsibility for our Illinois mission field, and give our most generous offerings to the Mission Illinois Offering this year.